More than a year ago I wrote about Sukhumvit Soi 38, a small alley near the Thong Lo BTS Skytrain station that is lined with food shops that are open only at night, at which time they spill out into the street. 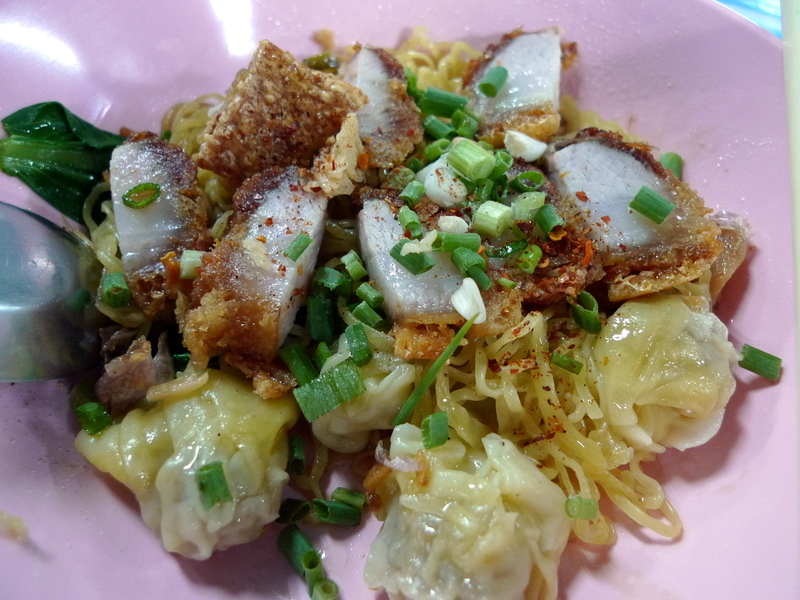 Soi 38 offers a lot of variety, freshness, and affordability, even if “fancy” isn’t on the menu. The other evening we went there for dinner and I thought I’d share a glimpse of the tasty dishes we enjoyed. 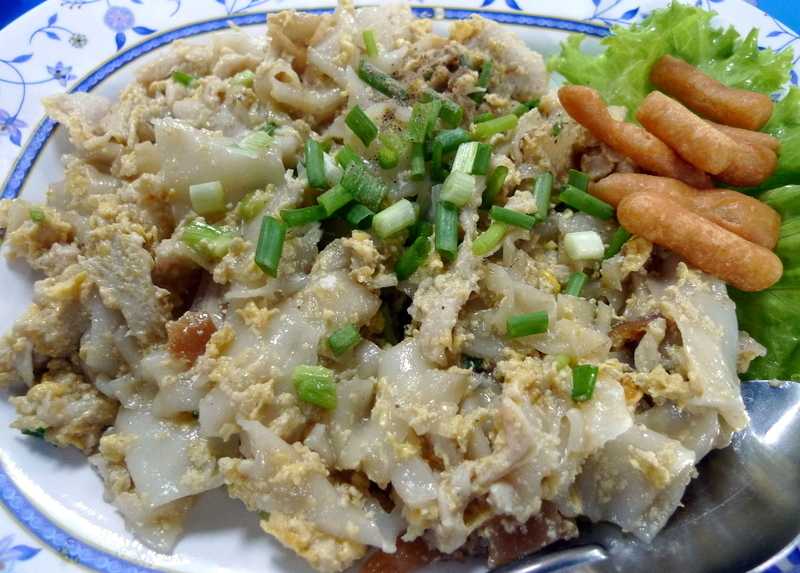 Guaytiaw kua gai – Stir fried wide rice noodles with scrambled egg and chicken. 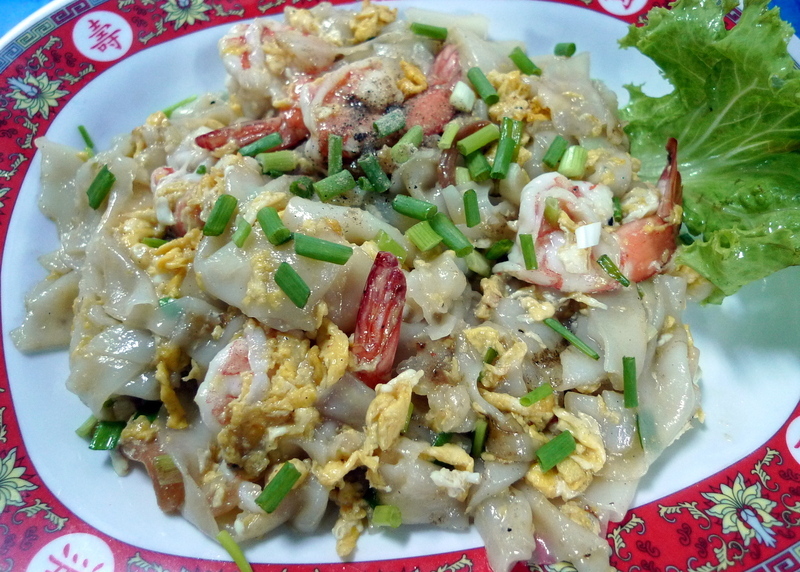 Guaytiaw kua gung – Same as above but with shrimp. 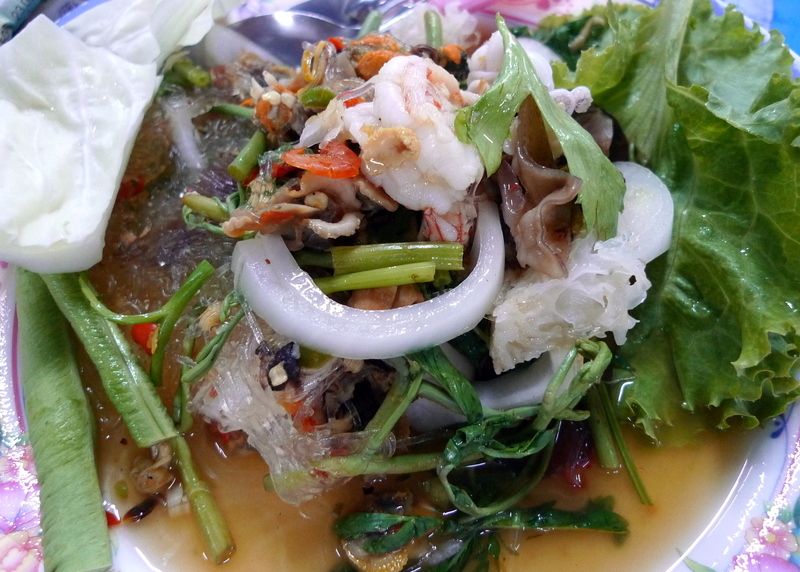 Yam woon sen talay – Vermicili salad with seafood, dressed with a mixture of lime juice, fish sauce, and chili. Noodles in Thailand always come with condiments – the final seasoning is up to the diner. The four most common condiments, usually served is a container with four glass or ceramic jars, are soy sauce (in this case, served in a Coke bottle! ), sugar, crushed red chili flakes, and fresh chilies in vinegar. Also notice that the egg noodles, which I ordered “dry” (they could also come in a broth) are served with the broth on the side. This entry was posted in Uncategorized and tagged Bangkok, Dining, food, Krungthep, Soi 38, Street Food, Sukhumvit, Thai Food, Thailand by christao408. Bookmark the permalink. New Thai restaurant opened up nearby – think I will give them a try tonight. Photographed myself making a meal last night in response to your challenge a few weeks ago. Will post later when I find my camera cord. Oh yeah… that last noodle soup (dry) looks tasty. Was there a lot of MSG int the broth? p.s. I’m seeing doubles. I love the dry noodles, especially when they are served with seafood, such a tiger prawns. What are those fried round stuff in the first photo? Somehow the food doesn’t look appetizing to me. What’s wrong with me!?!?! And what’s the thing in the first picture on top of the lettuce leaf? What are wonts?? And I was torn between commenting on this post or its twin… I think I may have to suggest we go to noodle alley for dinner… gotta get my Thai noodle fix (you had to remind me and my addiction is nagging at my mind- Pad Thai…). Many Thai food are not that beautifully presented, but they do satisfy one’s tastebuds with their rich flavor. I’d like to try the vermiceli salad first. I had the same question as Val, about the ‘ wonts ‘. Then I saw the picture and thought that the steamed dumolings or ( wontons ) are probably called that. I hope I get to see you in Bangkok this winter Chris. May be in January or mid December?? Not sure of the dates yet, but will keep you posted. This all looks delicious. I’m hungry now. just love the idea of hving the soy sauce form a Coke bottle…..
@agmhkg – Soy sauce… it’s the Real Thing! (TM) Ha ha…@murisopsis – @ZSA_MD – Sorry, typo for “wontons”… Zakiah, we’ll be around all winter so just let us know. Hopefully you plans will take you through our neck of the woods. @ElusiveWords – I had two windows open for Xanga, writing and entry in one and using the chat feature in the other. Somehow when I went back to correct a mistake, I ended up with a duplicate entry. Strange…@Umnenga – Oh, it is always the camera cord that is missing, isn’t it? @brooklyn2028 – @CurryPuffy – Little “croutons”… Sheldon, perhaps your taste buds are too discriminating for street food? @grammarboy – @ZenPaper – @slmret – @Dezinerdreams – Glad you enjoyed. @icapillas – These are simply stir-fries on a streetside restaurant, so the last thing they put any effort in is the plating and presentation! Ha ha…@stepaside_loser – That’s the one I ordered. Good taste, my man! @christao408 – why, thank you! Not being a meat eater, I’d go for that shrimp dish, it looks delicious ! Wow bami giaw moo krob looks awesome!!! @Wangium – I know the feeling. I’ve been wanting to get up to Toronto for a few years now and family weddings keep driving my travel decisions and depleting my budget! We’ll be here for at least two more years, probably much longer, so come anytime. @Chatamanda – I’m sure you’d enjoy it. The shrimp here are very good. @yang1815 – One of my favorites.